The best Father’s day watch for platinum lovers. 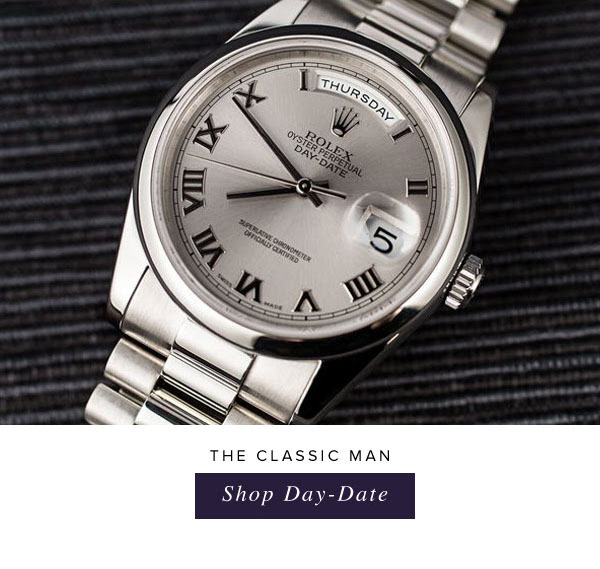 Originally released in 1956, the Day-Date is one of Rolex’s most iconic collections. The picture of sophistication, the Day-Date is commonly referred to as the “President” Day-Date because of its appearance on the wrists of many presidents and world leaders alike. The 18K gold coupled with advanced day and date displays makes this practical, yet extremely refined timepiece an ideal accessory for The Classic Man. A watch for those who love to speed down the road. There isn’t a watch better suited for a father with a need for speed than the Rolex Daytona. Named after the famous Daytona race, the Daytona was first released in 1963. Designed with racecar enthusiasts in mind, the Daytona features a tachometric scale for measuring speed as well as extremely precise timing down to one eighth of a second. The Submariner collection is a great watch especially if you’re exposed to water. The Rolex Submariner is the perfect watch for a father who is drawn to adventure. Designed originally as a line of sport watches, the Submariner is extremely durable and water resistant up to 300 meters, making it a great dive watch. The Submariner launched in 1954, and was soon worn by James Bond in many movies. Whether this watch is for a spy or a father, it is perfect for every Living Legend. Perhaps a vintage timepiece would better suit a a watch collector. If the father in your life has a rich appreciation for history, a vintage Rolex is an excellent gift. With models dating as far back as the 1950s, it is not hard to find a timepiece that appeals to a history buff. As the vintage watch market expands, more and more different types of models are becoming available. Here at Bob’s watches, we offer everything from vintage Day-Dates to vintage Submariners to vintage GMTs, making it the perfect place to shop for The Vintage Collector. The Batman GMT-Master II is one of the hottest watches on the market. For the father that does everything, a GMT timepiece is a match made in heaven. Originally made for airline pilots in the 1950s, the GMT offers wearers the ability to read the time in two different time zones simultaneously. Fondly nicknamed the Rolex “Batman” for its black and blue ceramic bezel, this watch is ideal for The Superhero in your life. **Place your order by Friday, June 17th 9am PST and pay by wire to receive it by Father’s Day.